Our Cozy Condominium is Just Steps from the Beach! This prestigious Mare Bella Oceanside condo boasts a large private balcony, perfect for watching the sun rise and set from your Adirondack chair. You’ll also enjoy spectacular 4th floor views of the Atlantic Ocean from every room of our corner unit. Our getaway comprised of 3 bedrooms, 2 full bathrooms, a spacious living room and kitchen which are all fully furnished and decorated in classic Jersey shore style. Our condo is in an exceptional location on a beach block in a quiet neighborhood with its own two parking spots. We sit on a large, free beach with lifeguards! Sunrise Park and playground are within walking distance with a paved walkway along the beach to the boardwalk. Visit the historic Cape May in less than ten minutes by car. Enjoy the beach, water sports, the boardwalk, golf, vineyards and much more all within minutes from your front door! Located at 503 E. Stanton Avenue, Wildwood Crest, NJ. Laundry room equipped with washer and dryer. There are 2 parking spaces that come with the rental in a covered garage and the condo has elevator access. Covered garage with direct access to the elevator. Sizable, light filled living room with a large L shaped couch and direct Ocean views! Our couch also pull out into a queen sofa bed! Regular drip coffee pot and a Keurig. You choose! Pots/pans, mixing bowls, cutting boards, serving pieces. Convenient sized kitchen with countertop seating overlooking the living room. Dishwasher Coffee Maker Dishes & Utensils Microwave Oven Refrigerator Gas Stove Toaster Fully stocked! Intimate dining area, will comfortably accommodate 6 and overlooks the light filled living room. Unbelievable ocean views from our large balcony. Furnished with 2 Adirondack chairs and a high top bistro table and chairs. Elevator access in building, short distance from unit. I spent an amazing week at this condo with my family. There were 7 of us and we never felt crowded. There is an amazing ocean view from each of the bedrooms and the living room, and the balcony has a fantastic ocean view as well . 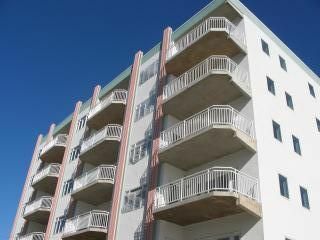 The unit is on the ocean block and there is only a 2 story motel between it and the beach. The beach at Stanton is short so you are at the beach in no time. The unit is set up well, with the master bedroom separate from the other 2 bedrooms, and the kitchen was very well stocked. The living room couch is huge and held all 7 of us . The dining table fit all 7 of us quite easily as well. There was even a cart to help bring your stuff to the beach, and some beach chairs and an umbrella as well. This is by far the best place we have stayed at in our16 years going to Wildwood. John is a very responsive owner and helped us out when we accidentally locked ourselves out of the unit. We look forward to returning next year, it's a great value . This is our family’s second year in this condo. My communication with the owner, from the beginning, was wonderful. This condo is well maintained and clean. The furnishings are lovely and the lounge chairs on the balcony are high quality. It’s a favorite spot for our family with an amazing view of the ocean and for watching the dolphins go by! This property is a short walk to a nice place to rent bicycles or just take a walk along a path that leads to the boardwalk. This is the best condo I've ever rented in the Crest. It's very clean, comfortable and cozy and has everything you could want. The views of the ocean are amazing, the beach is just steps away, and the condo is very nicely decorated and well maintained. The owner was very helpful and pleasant to work with and always responded immediately to all my questions. I highly recommend this condo to anyone looking for a home away from home to stay in while vacationing at the Crest. Thank you Laura! We're glad you had such a great time! My family had a wonderful time in Wildwood Crest. I am very happy I stumbled upon this condo.I will stay again whenever I make it back to the area. It was very clean and more pleasing to the eye then the pictures present. We had pot, pans, full fridge, spices, blenders, it was like being at home. The deck is fantastic. It was nice to have people over and be able to sit outside four floors up and every room has a view of the ocean. It felt very safe and close to the park and bike shop.The only con is I had to leave! Thank you Eric! Glad you and your family had a wonderful time! If you ever want to come back, just let me know. I have stayed here on Labor Day weekend for the last 2 summers with my boyfriend. The condo is always clean and welcoming when we arrive. Each room is comfortable and pleasant, not to mention the giant L-Shaped couch! The proximity to the beach is unparalleled, allowing you to wander back to the condo when the beach becomes too hot to bear and back again once you’ve cooled off. The balcony overlooking the ocean is truly special and gives the space a wonderful indoor/outdoor vibe. The owners are a great family and I will definitely be coming back here for years to come! Great space and even better location! Great space, tons of room, awesome balcony. Steps from the beach, and a ton of food and activities are close by. -Less than five minutes to bike trails, the boardwalk, the beach, and amusements parks. -Wildwood Boardwalk and Convention Center with three large amusement and water parks close by! -DR Bradley's Bike Rentals within walking distance. -Short drive from the Cape May vineyards, restaurants, and shopping!